Professional fire extinguisher servicing and maintenance is an essential part of any fire protection system. It is the responsibility of a business owner or responsible person to arrange the regular service. Stored pressure fire extinguishers consist of a cylinder containing the extinguishing agent (water, powder, foam etc.) and are permanently pressurised with either dry air or oxygen-free nitrogen. 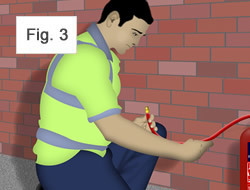 Fire extinguisher servicing should be carried out once a year to the standard laid down under BS 5306-3:2009. The service procedure involves thorough checking of the fire extinguisher for corrosion and partial or complete discharge. Reference should be made to the manufacturer's recommendations and instructions for specific information on servicing and recharging. Any fire extinguishers that are deemed unfit for use should be brought to the attention of the user and removed from service. 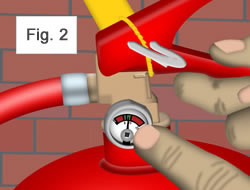 Visually inspect the fire extinguisher for corrosion and damage. Check that the operating instructions on the extinguisher are clear and legible. Once the discharge hose has been removed replace the ‘O’ ring. Weigh the extinguisher and record on the service label. If there is more than a 10% weight loss, investigate and recharge. Ensure that the wall mountings are secure and in good condition before replacing the appliance back on the wall. Every five years water, foam, powder and wet chemical extinguishers require a more detailed examination including a test discharge of the extinguisher and subsequent recharging. The above only applies to pressurised extinguishers, only. Gas cartridge extinguisher servicing has not been described here. Due to the amount of work to carry out the extended service, it is often cheaper to purchase a new extinguisher rather than carry out the extended service. Cartridge operated extinguisher are made up out of a cylinder filled with the extinguishant (water, foam, powder etc) and a gas cartridge containing highly pressurised CO2. 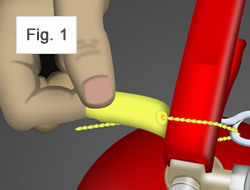 The cylinder itself is not pressurised while not in use and the pressure is only released from the cartridge once the handle is squeezed and pierces the cartridge. Refill the extinguisher with the contents from the bucket, re-install the cartridge and replace the headcap onto the extinguisher (ensuring that you have replaced the headcap "O" ring with a new one first). Every five years water, foam, powder and wet chemical extinguishers require a more detailed examination including a test discharge of the extinguisher and subsequent recharging. All Extinguishers are recommended to be replaced every ten years. Once the discharge hose has been removed replace the "O" ring.